Proponents of Initiative 1631, on the Nov. 6 statewide ballot, allege misleading tactics, and some business owners say they did not expect their enterprises to be listed on the flyer. No on 1631 says it got signed consents for the endorsements. 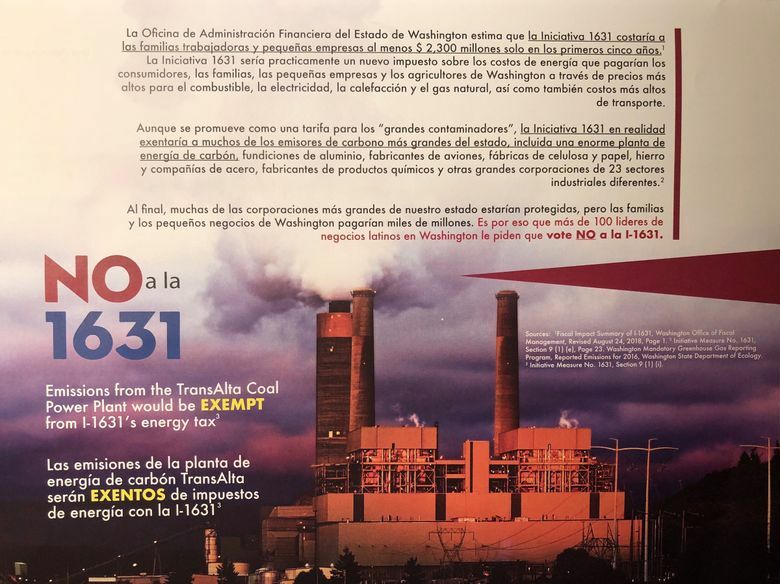 A Spanish-language flyer mailed by the No on 1631 campaign urges voters to “join our coalition and more than a hundred Latino owned businesses” to defeat the statewide November ballot measure that would put a carbon fee on fossil fuels. But the legitimacy of those endorsements erupted Tuesday into a volatile campaign controversy, as I-1631 proponents accused the opposition campaign of misleading tactics, while some business owners said they did not expect their enterprises to be listed on the flyer. Dana Bieber, spokeswoman for No on 1631, said owners of all businesses listed on the flyer signed consent forms. Those forms, copies of which were reviewed by The Seattle Times, laid out a case against the initiative and asked permission to publicly identify the businesses as opposing the ballot measure. I-1631 proponents said they learned late last week about the flyer. They said they contacted business owners and about a dozen told them they did not expect the names to appear on a flyer. The campaign held a Tuesday news conference where Attorney General Bob Ferguson, who has appeared in a TV ad endorsing the initiative, made an appearance. How much would I-1631’s carbon fee cost you at the gas pump and to heat your home? “I am not sure how low a campaign can go but this is pretty low,” Ferguson said. He urged the Washington Public Disclosure Commission to investigate for possible violations of campaign rules that regulate the use of endorsements. 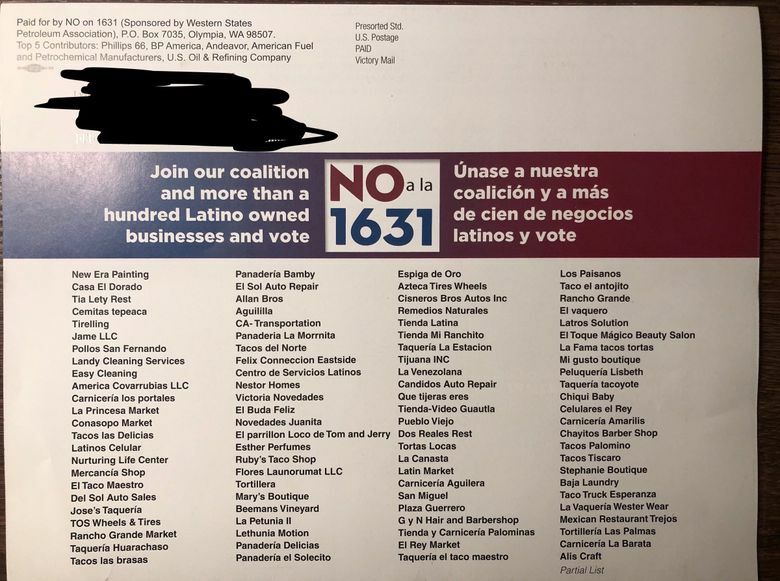 The campaign mailer listing the Latino businesses against the initiative described how I-1631 would be a new energy tax that would be paid by families and workers in agriculture. 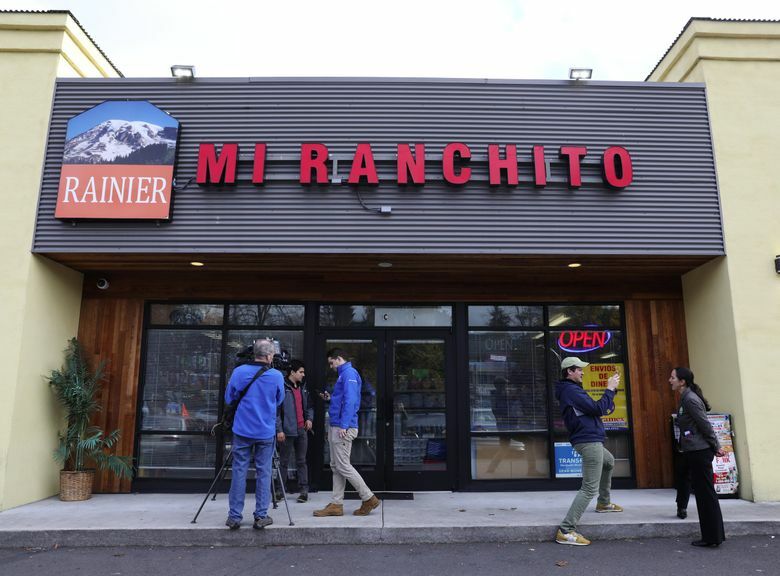 The news conference was held at Mi Ranchito, a South Seattle market that was one of the businesses listed on the No on 1631 flyer. The No on 1631 campaign later on Tuesday allowed The Seattle Times to view consent forms for the 96 businesses named in the flyer. He said an opposition representative then came to his business before the news conference and showed him the document he had signed. Jimenez told a reporter he thought it was about a tax on sugar and other food, and would not have signed it if he understood better. The Seattle Times also reviewed a copy of a consent form signed by a co-owner of La Conasupo. 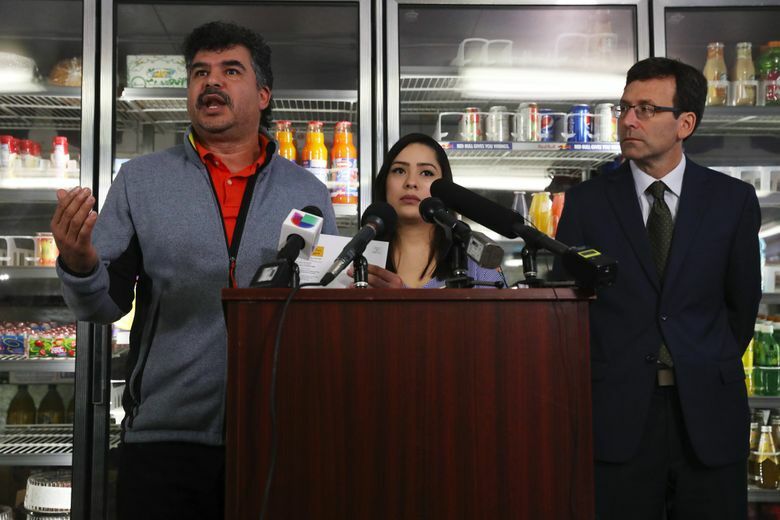 Co-owner Pablo de Vesos Doroteo told The Seattle Times he thought the measure was about a sugar-drink tax and he didn’t realize the business would be listed as part of the opposition campaign. Lara, owner of Seattle’s Taqueria Las Delicias, said he remembered someone coming to his business to get his signature on a form. But he thought the document he signed was against sugar, rent and city taxes. Lara said his business is open six days a week, 12 hours a day, and he hasn’t had much time to pay attention to initiatives. “Sincerely, we aren’t very aware of the news and the taxes and the laws that are on the way,” Lara said. I-1631 has emerged as the costliest ballot measure in state history, with the oil industry accounting for most of the more than $31 million that has been raised by the No on 1631 campaign. The ballot measure would put an escalating pollution fee on most state fossil-fuel emissions, and use the money to invest in programs and projects to reduce greenhouse-gas emissions that scientists say are driving climate change. Some of the money would be set aside to try to reduce the effects of rising fossil-fuel costs on low-income Washington residents. Opponents have labeled the carbon fee a regressive tax that would hit hard at low-wage workers who have to drive long distances to work.